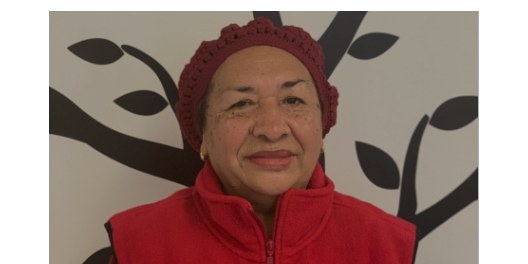 Meet Dina Rivas, a volunteer in NMIC’s Domestic Violence Project who has donated hundreds of hours of her time. Dina’s relationship to NMIC began seven years ago when she first came to NMIC to accompany a friend who sought support from the Domestic Violence Project. “We were greeted which such care and friendliness, which inspired me to learn more about the organization and all that they offer. With encouragement from the staff, I decided to continue coming in for the visits and sitting in for the support group meetings. I quickly adjusted my work schedule so that I’d be able to make the meetings on Fridays. With each meeting, my admiration for the knowledge and support shared has grown and inspired me to get more involved and help the women who attended the meetings.” Dina’s volunteer tasks involve lending a hand to the staff, informing newcomers about the various services available to them, and participating in events and programs. We are honored to have the support of committed volunteers like Dina. Email us to learn about volunteer opportunities or donate in honor of Dina for her commitment to empowering survivors of intimate partner violence.